Trump's order doesn't specifically mention Amazon, but he's accused the e-commerce giant of taking advantage of the USPS. President Donald Trump wants a review of the U.S. Postal Service's business practices. In an executive order announced late Thursday, Trump said the USPS is on an "unsustainable financial path" and directed a task force to study its operations and finances. Treasury Secretary Steve Mnuchin will lead that task force. Trump's order doesn't specifically mention Amazon, but he's accused the e-commerce giant of not paying its share in taxes and taking advantage of the USPS. Related Story The President Claims Amazon Costs The USPS A Fortune — Is That True? But as Newsy previously reported, the Postal Service loses tons of money every year, even without Amazon. For one, the volume of first-class mail it delivers has been declining for years, but USPS is still making a profit on packages. 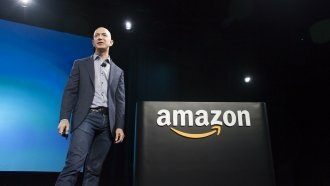 Amazon declined to comment to Bloomberg about the executive order. Trump's task force is required to submit a report on its findings and recommendations within four months.